Does your dog have the right stuff? What about you? Let’s be honest, is your dog a better athlete than you? Probably. But the real question is, can you at least keep up with your four-legged friend? 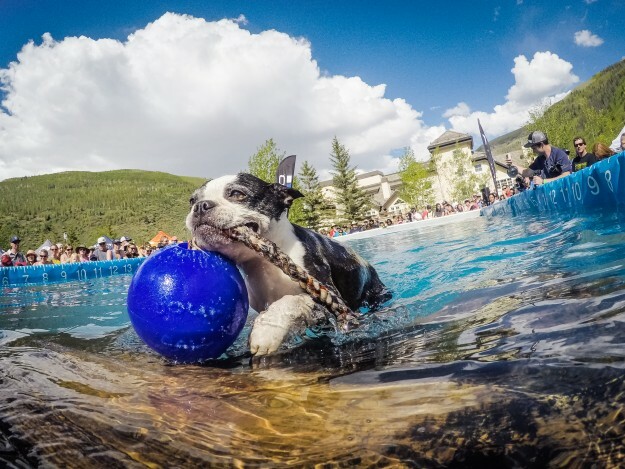 We’ll find out when the DockDogs and Rocky Dog trail run competitions get under way with a little help from Croakies at the 15th Annual GoPro Mountain Games June 9-12 in Vail. Every participant in the DockDogs or the Rocky Dog wave of the Superfeet Aprés 5K Trail Run will receive a custom Croakies dog leash. Croakies, as an official sponsor of the GoPro Mountain Games, will also be presenting the annual Iron Dog award to the winning dog/owner teams. DockDogs is a perennial favorite at the GoPro Mountain Games. The event sends dogs jumping off a runway into a pool of water. There are three competitions in DogDogs: Big Air, Extreme Veritical, and Speed Retrieve. The Rocky Dog wave of the trail run will be a “wave” of the Superfeet Aprés 5K trail run, where owners and their canine friends can run or walk the course and take part in the GoPro Mountain Games action in a fun and friendly way. 2016 marks the first year Croakies will be involved in the Mountain Games, exemplifying the brand’s focus on providing fun and meaningful outreach opportunities for its diverse consumer base. With an ever-expanding collection of products that includes its signature eyewear retainers, along with a growing line of dog collars and leashes, belts, lanyards, and a new line of guitar straps, Croakies is well positioned to partner with the GoPro Mountain Games, an event touted as the country’s largest celebration of adventure sports, music, and mountain lifestyle. “The VVF is thrilled to have Croakies on board as a sponsor of the 2016 GoPro Mountain Games. The Croakies brand and portfolio of products aligns extremely well with the 60,000-plus active, outdoor enthusiasts who flock to Vail each June for four days of athletics, art, music and mountains,” said Dave Dressman, Vice President of Sales and Sponsorship at the Vail Valley Foundation, which owns and operates the Mountain Games. Leading up to the GoPro Mountain Games, and to coincide with its onsite activations, Croakies plans to launch a consumer-focused, multi-channel brand campaign geared at showcasing the brand’s full mix of outdoor lifestyle accessories. To learn more about Croakies’ latest collection of eyewear retainers and lifestyle accessories, and to stay up to date on upcoming events and promotions, please visit croakies.com. Tom Boyd is Director of Communications for the Vail Valley Foundation and a co-founder of realvail.com. His writing and photography has appeared in The Denver Post, The Rocky Mountain News, Skiing, Paddler, 5280 Magazine and other publications throughout the Rocky Mountain West.